Visit Matthew Moss' studio in Monte-Carlo and discover the benefits Art Monte Carlo provides to all art lovers. Matthew Moss is an internationally known artist. He has been mentioned in Readers Digest and appeared on the front page of the Sydney Morning Herald. Important paintings by the artist are in the Monaco Royal Palace permanent collection and owned by the Government of Ireland. 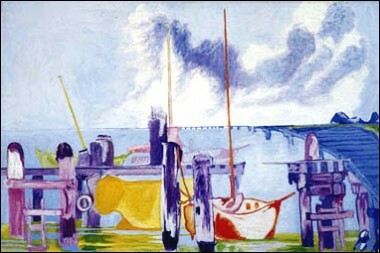 The late Robert Kennedy was also a collector of Matthew's paintings. The artist has lived for many years in the Principality of Monaco. Matthew is known worldwide as an expert on the conservation and the restoration of Old Master paintings. He founded the first Irish National Gallery conservation laboratory, and later the Regional Art Galleries of Australia. From the Old Masters page of Art Monte Carlo he will give you free advice to help you safeguard your valuable oil paintings. Rent original oil paintings to enhance the perception and image of your business and the aesthetics elements of your own life style. Follow the irreverent adventures and the chaotic life of the great Dutch Old Master, Rembrandt van Rijn, in the "Adventures of Rembrandt". Matthew's paintings of the Principality of Monaco, are uniquely bold and dramatic. His use of the painting technique, 'frottis' borrowed from the 17th century Old Masters of Bologna, result in landscapes imbued with an atmosphere of deep Romanticism.